This spring, take a trip Out of this World with Three Rivers Ringers! 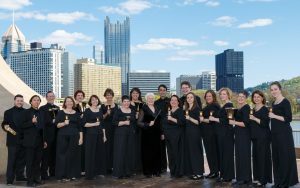 At the Spring 2019 Concert Series, Pittsburgh’s premier handbell ensemble will blast off in honor of retiring Artistic Director Nancy R. Lutz, achieving Escape Velocity, visiting Jupiter, taking a Stairway to Heaven, welcoming the Age of Aquarius, and much more. From classical to classic rock, it’s a voyage to remember. The countdown begins… be there!